When I was a kid, I read voraciously. I was always in the middle of at least one book, and always had two or more in the wings. These days, I don’t have time to read quite that much, but I still read a lot, and my favorite kind of book to read is the kind I write: middle grade fiction. I’m very lucky: Middle grade is an exciting, creative field of literature. It was hard to pick my five favorite books (try 40 favorite books; that’s more accurate! ), but this is a narrowed-down list of books I reread again and again . . .
On the day before his 11th birthday, Will Stanton finds his world changed: A dread has crept over everything, making his family’s farm animals afraid of him. When he and his brother James see rooks attack a tramp and James thinks nothing of the incident, Will knows that something has taken the memory from James but not from him. This sense of dread increases, and Will soon learns why: He’s one of the Old Ones destined to stop an ancient evil power from consuming the world, which it’s about to try to do shortly after the birthday on which he attains his powers. His efforts to stop the Dark involve his frantic collection of Signs, each one imbued with history and power. This classic Chosen One narrative was the first middle grade book I truly loved. I love the characters, the British lore, and the action—and its rural world often felt a lot like my own. I still feel that way when I read it, and certain scenes (including the spectacular climax) continue to send a delighted chill down my spine. Corinne La Mer can handle just about anything: the competition at the village market (she sells the most glorious oranges from a tree outside her home), the scorpions that boys use to try to terrify her (it doesn’t work; she’s not afraid of scorpions), and, eventually, a beautiful stranger who emerges from the woods with a disturbing plan. Jumbies are only stories, Corinne has always thought, but the beautiful stranger turns out to be one, and she’s bewitching Corinne’s widowed father, and has her eye on even more. I loved the vivid setting and tense storytelling of this book. Corinne is strong but frightened, a real girl placed in a Haitian folktale come to life. I also loved the chapters from the jumbie’s perspective. I didn’t fully sympathize with this story’s villain, but I appreciated understanding where she was coming from. It’s 1727. Three men and nine children from the island of Hirta in far northern Scotland take a short boat trip to Warrior Stac, a massive finger of stone in the sea, to harvest birds. It’s a rite of passage for the children: to work on the Stac for three weeks, then return to Hirta when the boat comes to pick them up. But this year, the boat never comes. Anger, fear, and despair wash over this small community as it struggles to find ways to survive—both physically (there is no fresh water on the Stac) and emotionally. The voices of all the children in the story felt so present: their struggles, their arguments, and their small kindnesses. I loved seeing how they came together, but also how they splintered, and the different bonds that formed among them. And Quill—the sensitive and wise boy from whose eyes we see this tale—is a perfect hero: brave and humble and simply a kid. This is a powerful story about the instinct to survive, but also how children dream of the future even when they know they might not have one. Young Wolf is fleeing the monastery where he has lived since age six, the wounds and memory of a humiliating beating driving him on. As he runs, he encounters an elf child caught up in the hunt of the lord of a nearby castle. At the lord’s demand, Wolf catches the child, and then tries to teach her to speak; he lord wants her lead him to the underworld where he’s sure the elves had stolen his dead wife. Nest, the lord’s young daughter, who wants to make something of her life before her impending marriage, helps him and is his only true friend. I loved the story, the bleak medieval setting, and Wolf’s determination to try to succeed. And I loved how the legends and magic blend with history. This is a fast-paced, occasionally funny, and ultimately heart-warming tale of belief, good, and evil with a huge and dramatic hunt at the end. An attack on her homestead in 800s Britain is the young serf Gwynna’s first sight of Arthur, the leader of a war-band that is invading West Country settlements. But Myrddin, Arthur’s bard and advisor, has greater plans for him than simply pillaging—and they include creating a legend with Gwynna’s help. Soon renamed Gwyn and disguised as a boy, our heroine rides with Arthur’s war-band and watches his legend take hold through Myrddin’s crafty stories. With her own stories, she helps the gentle would-be warrior Peredur, whom she once knew when he was disguised as a girl (his mother’s plan to save him from his brothers’ brutal fate), as well as the unhappy Gwenhwyfar, Arthur’s reluctant wife. 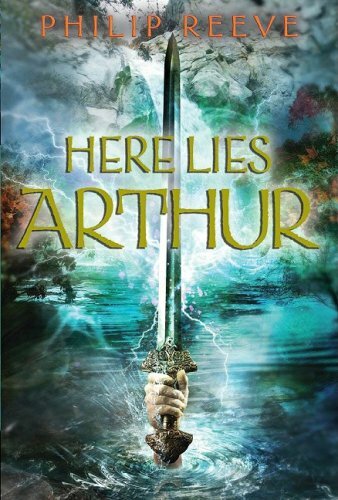 This is the story of King Arthur as he really might have been in all the raw brutality and small beauties of his world. I often dipped into this book while I was writing my own debut novel when I was stuck on a scene and needed to step away from my own work. The prose is gorgeous, the characters true to life, and the settings rich and real. This is one of my favorite books, and will always make a list of this kind. Publisher’s Synopsis: A Scottish medieval adventure about the youngest in a war-band who must free her family from a castle prison after knights attack her home–with all the excitement of Ranger’s Apprentice and perfect for fans of heroines like Alanna from The Song of the Lioness series. Diane Magras grew up on Mount Desert Island in Maine. The Mad Wolf’s Daughter is her debut novel. She is the editor, writer, and chief fund raiser for the Maine Humanities Council. She volunteers at her son’s school library, and is addicted to tea, toast, castles, legends, and most things medieval. Diane lives in Maine with her husband and son and thinks often of Scotland, where her books are set. Diane Magras, author of The Mad Wolf’s Daughter, selected these ‘5 Middle Grade Favorites.’ Discover more articles on The Children’s Book Review tagged with Middle Grade Books.